It was Day 6, two days before the wedding – remember the wedding? – and our last day in the cloud forests, so we packed up, had one more delicious breakfast, and checked out of our beautiful cabina at Arco Iris Lodge – a very special place we will long remember. Before leaving the area, we drove back up “The Burma Road” one last time to visit Bosque de las Ninos, the Children’s Rain Forest, and to walk on some different trails to look for the famous Three-Wattled Bellbirds. The first fauna we saw were 2 Central American Agoutis crossing the trail. These are diurnal rodents that look like fat, brown, plump squirrels with no tails and are about the size of raccoons. We paused at the butterfly garden area again, being impressed as always by the giant Blue Morpho butterflies. Among the largest in the world with a wingspan of 5 – 8 inches, they fly almost in slow motion, a wafting patch of iridescent blue against the many greens of the forest. Again, the dry forest was interesting to see – the total lack of moisture-loving plants with dry, sandy soil everywhere. As we walked along, we repeatedly kept hearing a tantalizing bird-like sound off in the forest – a siren call luring us farther along the trail and deeper into the forest. We seemed to get no closer to the bird (or birds) making the calls. We finally realized we were hearing the odd “dong” call of the Three-Wattled Bellbirds – but they remained illusive and we never saw one. Fortunately, we had seen them on a previous trip to Panama, and it was magical to hear them. We drove back down the road toward San Jose , watching lowering clouds coming inland from the Gulf of Nicoya to the west. The approaching thunderstorm was typical in the afternoon at this time of year (middle of August). The unending views on the way downhill were spectacular– mountains and valleys – a hundred shades of green, green, green. We stopped again for a good meal at the “landmark” La Cuenca Ristorante on the high embankment above the Rio Aranjuez– another arroz con pollo casado. We got back to our Hotel La Rosa de America (without getting lost very badly) near the town of Alajuela in time to chill out, do some reading, relax by the pool, and finish the last of our special Monteverde Quaker cheese and crackers. We also got re-acquainted with the raucous family of Rufous-naped Wrens that ruled the hotel gardens. These loud, busy, speckled birds are about 2 inches longer than our Carolina Wrens, and much more vocal. Day 7, and we decided to go back to a favorite birding place from previous trips – the forests near Volcan Poas, a steamy volcanic crater north of Alajuela, that continues to smoke and spit. At a higher elevation, it’s a beautiful place to bird as well as to see an ancient volcano – if you get there before the clouds settle in around 10 AM. Robert our genial host at our hotel, made us a good map and we headed north. The skies were sunny and we could see the lush mountainous countryside all around us as we drove the narrow, busy roads through small villages and fincas (farms) with various crops of coffee, corn, and fields of nursery plants. We came to a one-lane bridge and pulled off on a very slim verge to look at a dark bird perched on a fence – a Black Phoebe, which was new for us in Costa Rica. I decided to get a closer look at what the bridge spanned and discovered to my horror it was a river located about 1/4 mile down below in a deep ravine with jungle on both sides. It was a tremendous sight! During our driving adventures in Costa Rica, Phil discovered that there is a sign usually on the downhill side of narrow bridges that means “give way” – the driver coming down hill has the right of way. What we eventually learned was that the driver with more guts and grit gets the right of way! We crossed that bridge once more that day and twice more the next day, and both times we saw the Black Phoebes – 2, and each time I held my breath as we passed over that very narrow, very high, very old bridge. And usually, we let whoever wanted it have the right of way! The road climbed higher and higher toward the crest of the mountain to Vulcan Poas. We had been told that a man had gotten lost on the trails there a few days ago, and that we would probably see police and searchers still in the area. When we arrived at the entrance gate, we were told that we could go in, but the trails were closed since they were going to be using search teams with dogs – and didn’t want sightseers interfering with their activities. When we left the country, we learned that the man was still missing. We were told that someone disappeared from those trails several years ago and showed up a month later on the other side of the mountain. If you can imagine (or know) what the jungles, rain forests, and even the Appalachian Mountains in Western North Carolina look like – you can appreciate how easily it would be to become lost and disappear. It happens in Graham County, N.C. every year! Since the weather was still holding, we walked our slow pokey way up to the crater, watching for birds in the forest and along the paved trail and saw Mountain Elaenias and a Slaty Flowerpiercer. We got good views of the crater, took photos, and fortunately, the winds blew the steamy, sulphurous fumes away from us. Along the side of the crater we could hear Rufous-collared Sparrows singing their sweet song, which ends in a lovely echoing trill. We walked back towards the visitor center, and gradually the weather turned and it began to rain. Of course, this was the day we had left our rain gear at the hotel. By the time we got to the café, we were dampish, and since it was chilly, a hot drink was called for. Just as we sat down to tea and coffee, we looked up and there were our cousins, Kalicca and Tom with two of our granddaughter’s friends. They were all in Costa Rica for the wedding. So we warmed up together, amazed that we had all ended up in the same place at the same time. When the drizzle stopped, we birded in the area around the parking plazas and found a few more birds – Sooty-capped Bush-Tanagers and a Black-billed Nightingale-Thrush, but nothing new. We drove back down toward Alajuela and on the way, Phil found a restaurant in the small town of Fraijanes called Freddo’s Frescas. It turned out to be one of our best meals of the trip – all home made things prepared in their open kitchen and we ate delicious fish and yummy fruit smoothies. Even the salad dressing was special. Our waiter (probably Freddo himself) saw our bird book and told us not to miss their gardens across the road. When we were finished, we walked (under our umbrellas) to the gardens and were very impressed. Many flowers bloomed in colorful displays along winding walkways with lots of hummer feeders and lots of hummers. 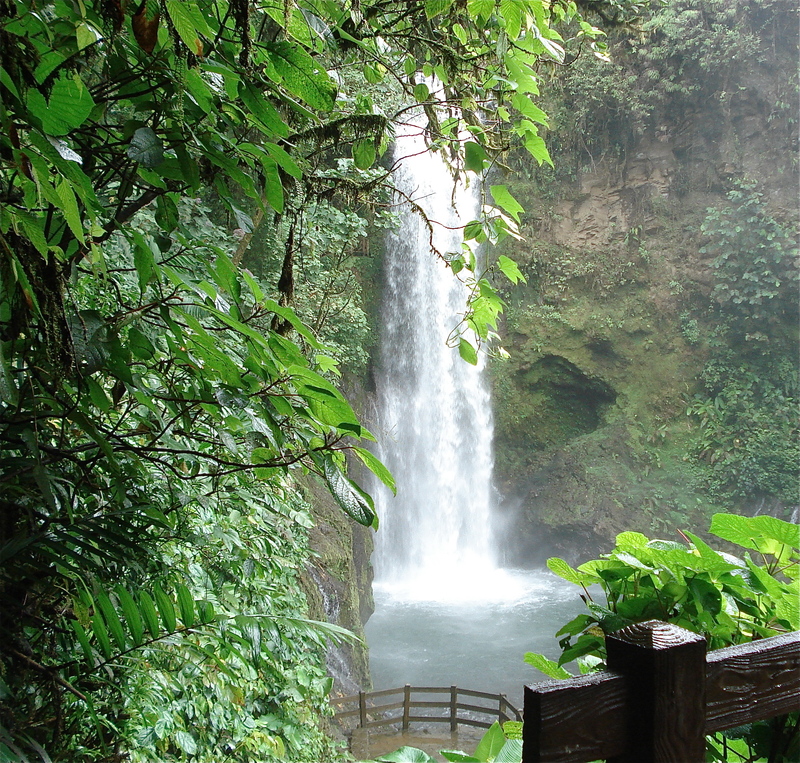 On Day 8, we decided we would forgo our hotel breakfast and treat ourselves to a breakfast buffet at La Paz Waterfall Gardens, a side trip off the road to Vulcan Poas. Phil had read in A Bird-Finding Guide to Costa Rica (by Barrett Lawson) that there was good birding there with lots of feeders. We drove back up the same road to Vulcan Poas, only turned right at a fork in the road at Fraijanes, where we’d had lunch the day before. The very rural area near La Paz had suffered a huge (6.2) earthquake in 2009, wiping out a town or two, killing 75 to 100 people, and destroying most of the roads. We’d been told that the road was clear at least to La Paz, so off we went. Another adventure! The paved road eventually petered out to another “Burma Road”, and we could see that the whole sides of mountains had slid down, and that the place had been devastated, taking houses and whole villages with them. The road was in terrible shape, down to one lane in many places and not repaved as yet – if it would ever be. Things looked pretty sad enroute, so we were pleased when we arrived at La Paz and it was up and running and looking great! It is kind of resort – accommodations, several beautiful restaurants, and patios and balconies – all overlooking gardens, and trails leading through the forest and down into the ravines to the waterfalls. We started with the breakfast buffet on the balcony overlooking the forest with the mountains in the background, and fruit-filled bird feeders full of birds almost within reach of the tables. It was a truly bountiful buffet – for the birds and for us. We ate leisurely, enjoying the birds and the view of the nearby jungle and mountains, with the sound of the waterfalls below us, and in the distance views of some areas where slabs of mountainsides had slid down. 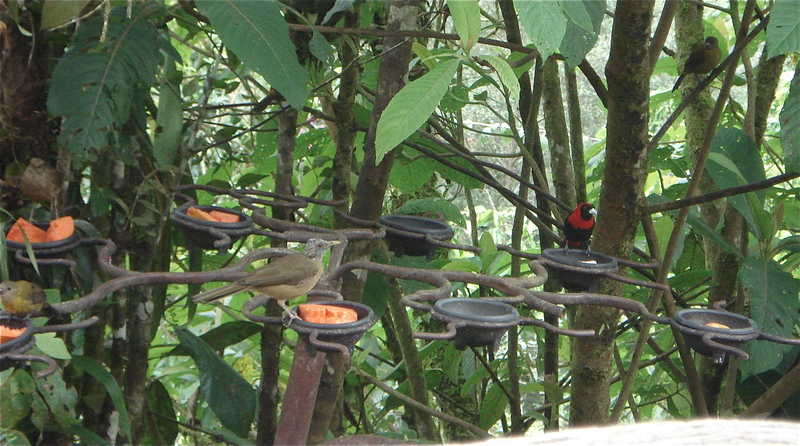 Lifer #8 came into the feeders while we ate – a Crimson-collared Tanager. We finally tore ourselves away from the breakfast decadence and headed down a trail. The trails were excellent, beautifully designed molded slabs of concrete with sides and handrails made to look like logs and branches. One trail led to a zoo area where they had huge cages displaying reptiles, amphibs, insects, birds, monkeys, etc. We managed to skirt those, noting however that they looked extremely well-done, with many live plants and water streaming through them. There was a large patio garden area where dozens of hummingbirds were attracted to the flowers and to the numerous feeders hanging all around, with seating (for the birders) in vine-covered gazebos at the edges of the patio. We sat and watched for over an hour and after sorting out the 8 to 10 species in the garden, we managed to find 2 new hummers – LIFER #9 – Black-bellied Hummingbird and LIFER #10 – the Green Thorntail. We enjoyed watching them all and hated to leave, but had not yet seen a waterfall! We followed one of the trails that led down through a deep jungle gorge to the La Paz River – about a million concrete steps down – and followed the river even farther down as it tumbled over several waterfalls along the way. Even though some of the waterfalls had been “rearranged” by the quake, what we saw was magnificent and we were glad we went. The stairs and the extensive systems of guardrails were constructed of this same concrete log-like material and was very attractive. The whole thing was an impressive engineering feat, especially accompanied by the roar of the falls and the mist rising up into the vegetation all along the way. Since the wedding festivities would begin that evening with a rehearsal dinner at the groom’s parent’s home, we returned to our hotel, adjusted our goals, turned off our binoculars, put away the field guides – no longer on a quest for birds, but looking forward to meeting 400 or so new Costa Rican cousins. And the bride was beautiful. It’s a good thing we got there early!